Every sunday Crossroads high school hosts the Entertainers league. The competition is really good and the league is ran really professionally. The Entertainment League is a division of Entertainment League Productions. The E League formerly operated as the NBA Entertainment League for 11 seasons. The NBA Entertainment League was featured in an article in the American Way magazine.The E League’s co-founders are Shane Duffy and Felisa Israel. As NBA Director of Entertainment Marketing, Shane helped create the NBA Entertainment League. For 12 seasons, he has managed the Entertainment League and has served as the League’s Commissioner. Additionally, Shane has coordinated product placement and licensing in film and television, and brokered deals between motion picture studios and the NBA. He served as NBA liaison during national broadcasts, a position critical to the seamless coordination of game presentations to millions of households. 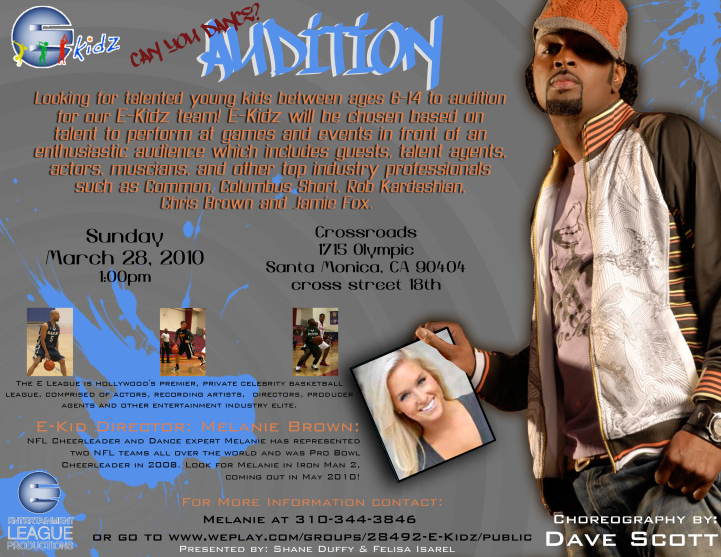 Master classes and auditions for the E-Kidz dance team March 20th and 21st! Michael Jordan is back in the game…. FULL ON.